JERUSALEM — Over 100 tablets that date back to the times of Nebuchadnezzar’s rule in Babylon, now modern-day Iraq, have been placed on display in Jerusalem as a further testament to the reliability of the Scriptures. The palm-sized tablets, which provide a glimpse into the lives of the Jews during the time they lived in exile in Babylon, had been discovered in Iraq and held by a UK-based Israeli collector. 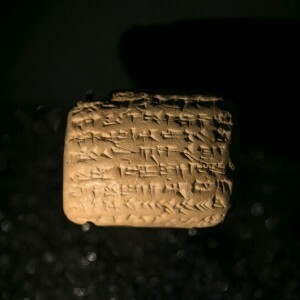 The artifacts contain writing in the ancient akkadian cuneiform script and detail transactions, trades and contracts between Jews in approximately 500 B.C. They also trace at least one Judean family over four generations: a man named Samak-Yama, his son, grandson and his grandson’s five children. Some of the names cited in the tablets include references to Yah, such as Netanyahu and Shalemiyahu, signifying the name of God, or Yahveh. As outlined in the Old Testament, which is known to Jews as the Tanakh, Nebuchadnezzar, the king of Babylon destroyed Solomon’s temple in Jerusalem and forced many Jews into exile. “But after that our fathers had provoked the God of heaven unto wrath, he gave them into the hand of Nebuchadnezzar the king of Babylon, the Chaldean, who destroyed this house, and carried the people away into Babylon,” reads Ezra 5:12. “Now in Shushan the palace there was a certain Jew whose name was Mordecai, the son of Jair, the son of Shimei, the son of Kish, a Benjamite, who had been carried away from Jerusalem with the captivity which had been carried away with Jeconiah king of Judah, who Nebuchadnezzar the king of Babylon had carried away,” Esther 2:6 also outlines in providing the story of Esther, who later became the Queen of Persia, or modern-day Iran. Historians believe that the discovery of the ancient tablets, which also mention the Chebar River noted in Ezekiel 11, to be a fascinating find. “On the one hand it’s boring details, but on the other you learn so much about who these exiled people were and how they lived,” he said. Filmmaker and author Simcha Jacobovici wrote in an article for the Huffington Post last week that the tablets underscore the accuracy of the Scriptures. The tablets are now on display in Jerusalem’s Bible Lands Museum, and will be available for public viewing for the next year.